For the first time in the history of the NJCAA athletic program at Coastal Bend College, a CBC student athlete has been chosen as the NJCAA Region 14 Conference Player of the Week. Yarelli Rios, a softball player, is currently in her freshman year studying to become a physical therapist at CBC. Rios is from McAllen, Texas, and is the daughter of Milko Jasso and Imelda Rios. She was given the honor of being player of the week due to her impressive performance at the Midland Spring Classic tournament held February 15-16 in Midland, Texas. At the tournament, Rios batted .500 going 7 for 14, and she hit 3 home runs and had 6 runs batted in. “She’s worked very hard, and I can’t express how proud we all are of her. When she found out she was very flattered. CBC is proud to have student athletes with as much talent and dedication, on and off the field, as Rios has,” said CBC Head Softball Coach Frank Moron. 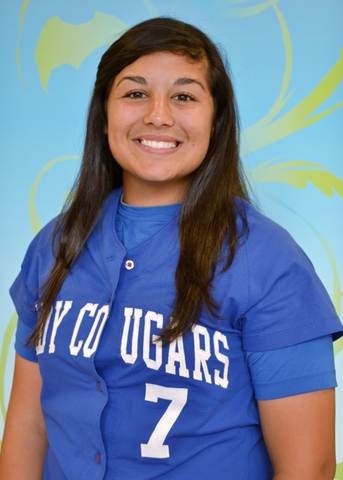 You can catch Rios and her teammates live when they play their next home game on March 8, 2013 against Alvin College at 1 and 3 p.m. at Veteran’s Memorial Field in Beeville, Texas. For more information about the NJCAA athletic program at CBC, please contact Estevan Vasquez, Athletic Director, at (361) 354-2721 or via email at jevasquez@coastalbend.edu.